What makes creative people tick? 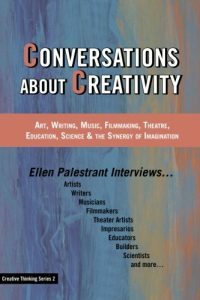 My latest book, CONVERSATIONS ABOUT CREATIVITY: Art, Writing, Music, Filmmaking, Theatre, Education, Science & the Synergy of Imagination, is now available for sale on AMAZON. I spent a large part of 2017 interviewing a wide-range of fascinating, creative people about their individual and collaborative creative processes. Wow, great looking book and I can hardly wait to read everything! Kudos, Ellen, well done! I”m just amazed how you’re able to put together such great works and complete them not only on time, but before time. I thank you for doing that interview of me, and now it’s in a book. Can’t wait to see and read it in its entirety, Looking forward to getting together with you soon Ellen. It’s been such a crazy year for you and I. 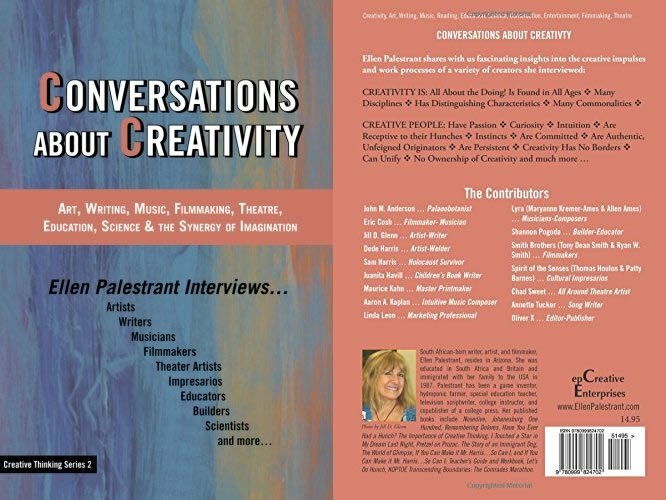 How exciting to read the interviews of such a wide variety of creative people. 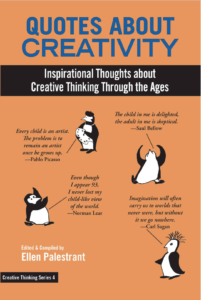 Conversations about Creativity reflects a tremendous amount of your own creativity, from the germination of the idea for this book to the beautiful writing within. 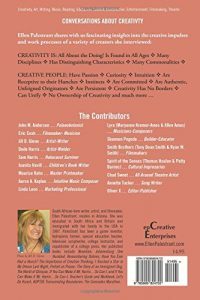 Exploring creativity by interviewing people involved in a wide variety of fields is inspired. I am honored to have been interviewed by you, Ellen. I learned a great deal from the interview process and learned even more from reading about the lives, work, and creative processes of the individuals featured in your book.Thank you for your dedication to turn your idea into a book. May it be an inspiration to all who read it! To be a part of this book among so many talented participants is indeed a privilege . What an exceptional opportunity you have given each of us. Your unique ability to ask pertinent questions …addressing what “makes us tick”, and why we do what we do, made each interview such a fun read on your website. I could actually hear each personality you showcased. Can’t wait to get my copy of the actual book where we all, along with your voice, now reside as a group. Ellen this is an amazing book you never cease to amaze me with your creativity. Thank you for including me I am proud to be a part of it.